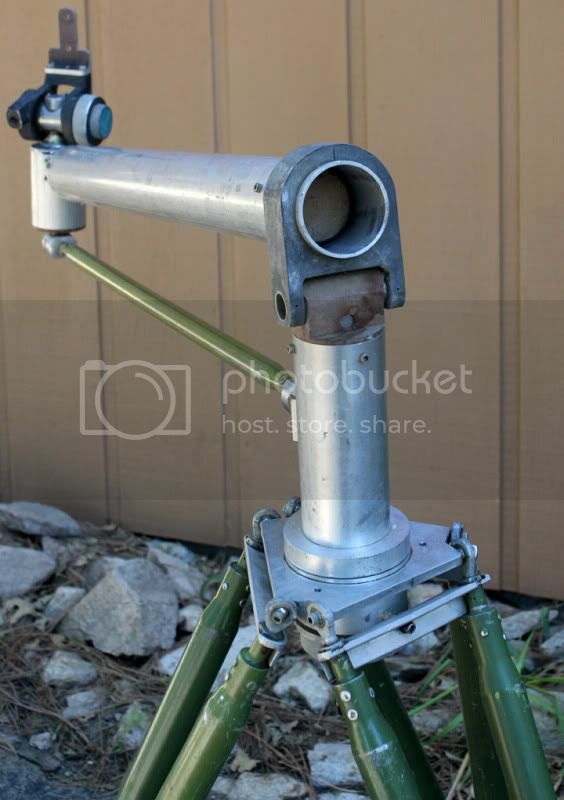 This is a description of a counterweighted parallel arm mount I made to hold a pair of 11x80 binoculars. 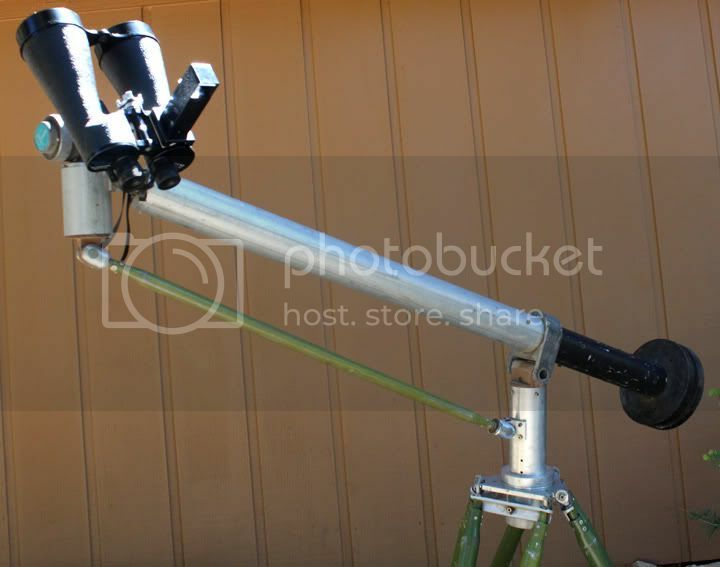 The binocular mount is shown here is the for the observer standing. 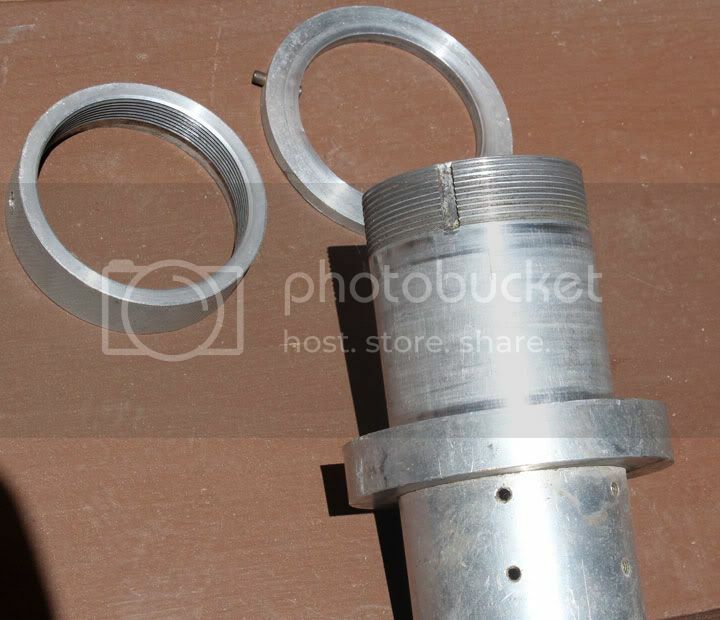 The binocular mount was made many years ago using only hand tools, 13" lathe, belt sander, and 14" bandsaw. This was a typical ATM project with materials used range from surplus cannibalized microscope mountings, linen filled phenolic composite, magnesium alloy, 3" diameter 6061-T6 aluminum tubing, assorted 6061-T6 aluminum flat pieces, a 1" diameter surplus aircraft control rod with tapered ends, cast iron body building weights, Thomas fluid filled camera head, and whatever was available that could be scrounged or bought surplus. Part of the process was to learn how to work with scrounged materials and at the time, to learn the skills of how to use my newly acquired 13" lathe. 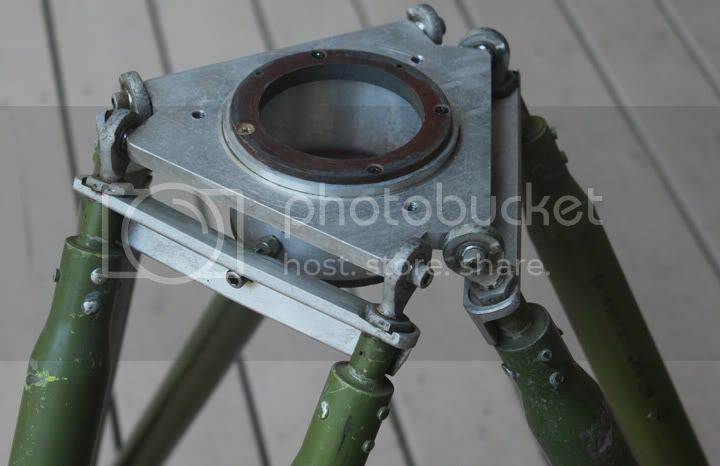 The binocular mount was designed to be disassembled by one person for transport in a small car. 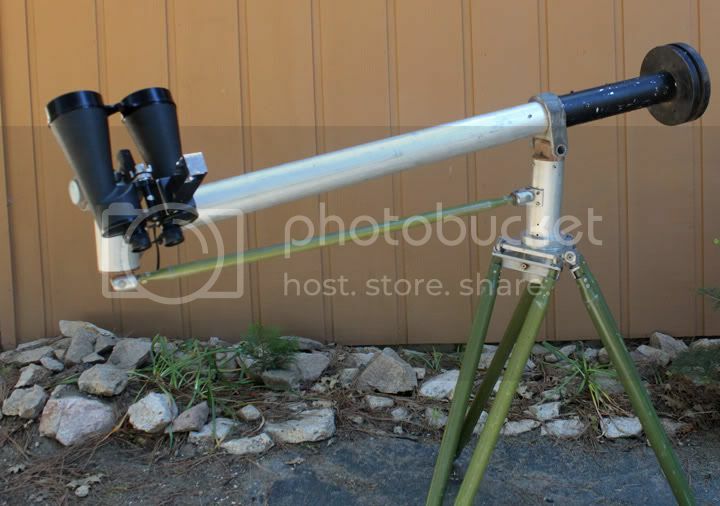 This meant that the counter weight should separate from the main mount body, the mount body separate from the tripod and the tripod collapse into a transportable size. 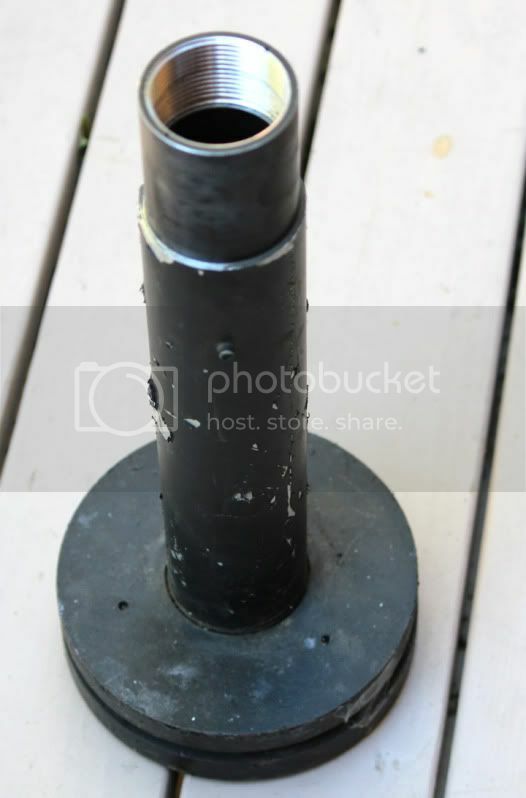 The tripod was covered in another post. 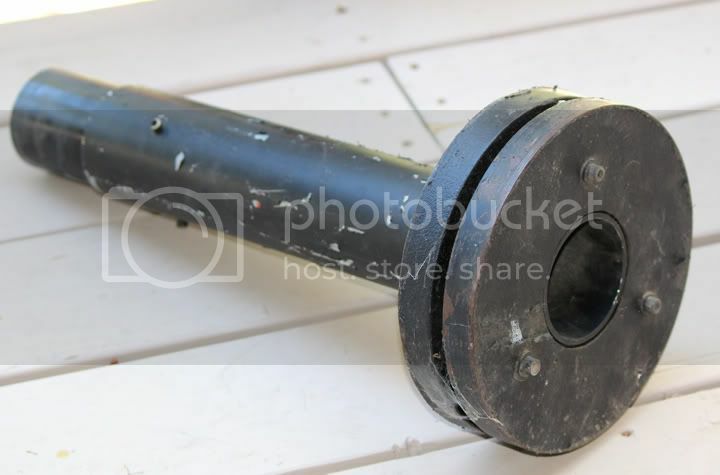 Note the flaking black coating on the counterweights and shaft. 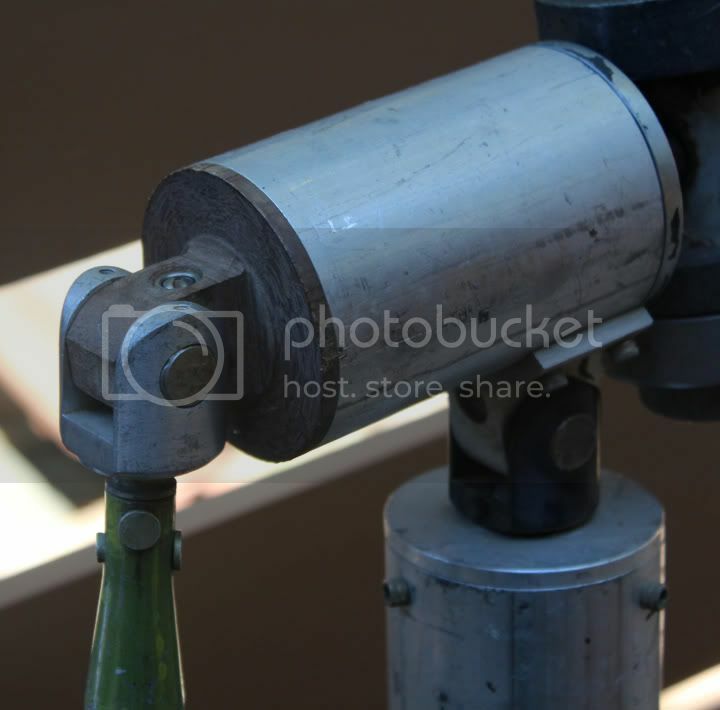 The shaft and counterweights were coated with a rubber coating, the kind one dips tool handles in. this turned out to be a mistake for over the years the rubber coating did not survive dings and bumps when being transported. Also note the Rigel Systems Quickfinder mounted on the 11x80 binoculars. 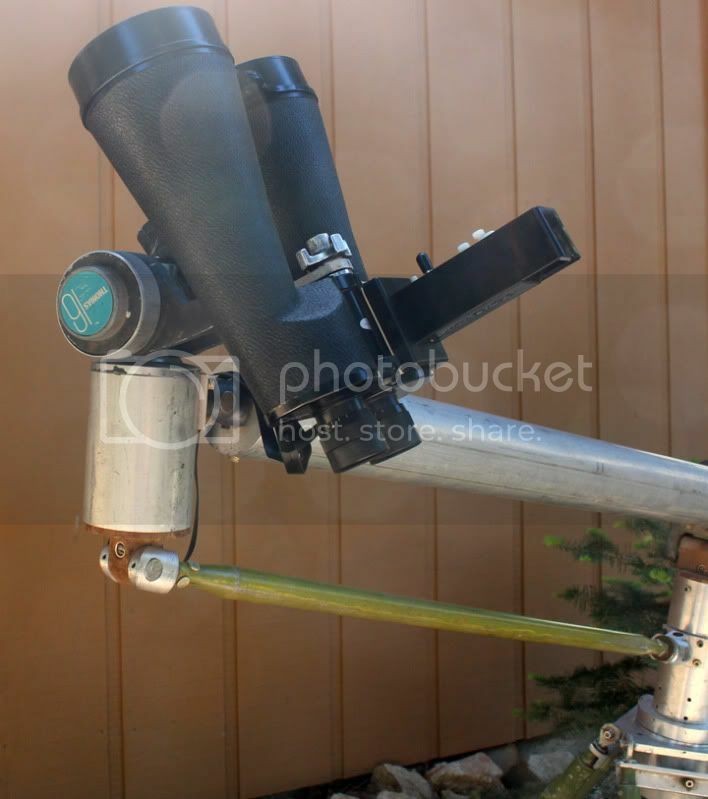 I have used this binocular mount for many years and it has worked very well. Thanks. The bino mount has worked really well for many years. Note that each pivot bearing on the bino mount has its own adjustable friction slip clutch allowing the binos to easily stay put after they are positioned for height. Very good, Don. I use the Quickfinder myself, on my own parallelogram mount. Nice little reflex sight. Is that green finish a chromate primer? Is that green finish a chromate primer? I believe so. Came from the aircraft surplus on Sultana Ave down in Ontario that way. I typically have aluminum anodized though. Wish I could work with metal as well as I do sometimes with wood.